It’s been 2.5 years since I wrote about a day in my life. Much has changed since. 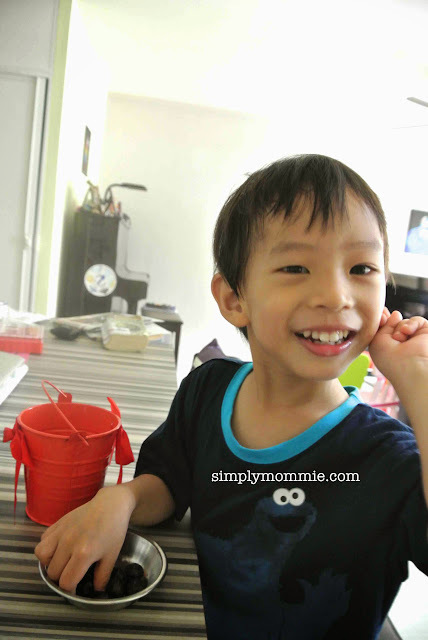 My preschooler is now in primary school, while my toddler has become a preschooler! Where did all the time go? This year I’m homeschooling my preschooler so while we have ‘school’ at home on most days, twice a week we’d go for co-op with two different groups of homeschool friends – one Chinese co-op where we do everything in Mandarin – from reading a book to doing activities, to conversing, even among the mums (we try our best to do so to encourage our kids to try using the language); and another where we meet for playdates and sensory play. 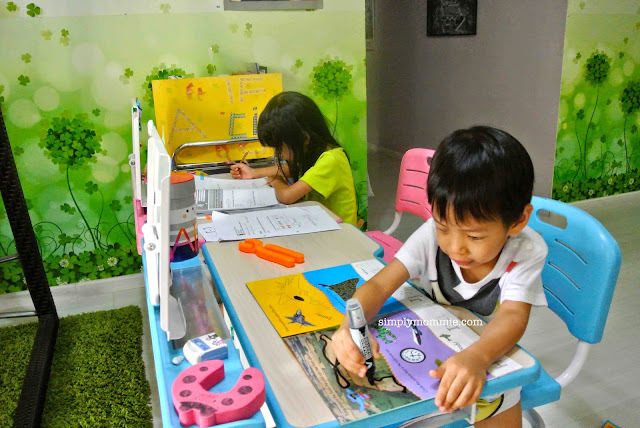 Today, I’ll be sharing one of the days that we do school at home. The day starts with getting my girl ready for school. Most days though, my hubby is in charge of this, when it’s just confectionary bread for breakfast. 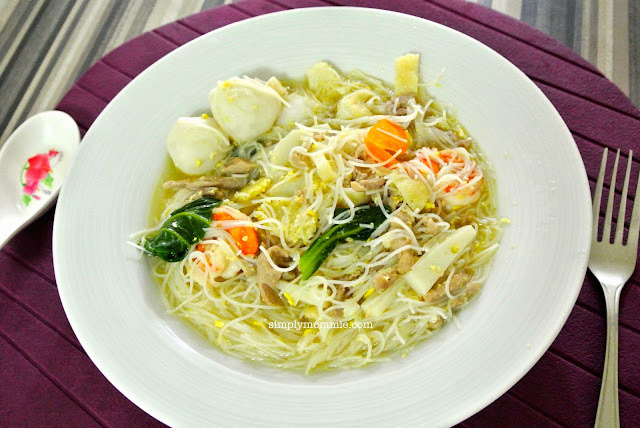 Today I warm up their favourite green bean soup for breakfast (read more about breakfast & food for recess ideas). While she’s eating her breakfast, I tie up her hair then I head back to rest because thereafter she’d wash up on her own and go off with my hubby to school. Today I wake up earlier than him so I head out of the room. 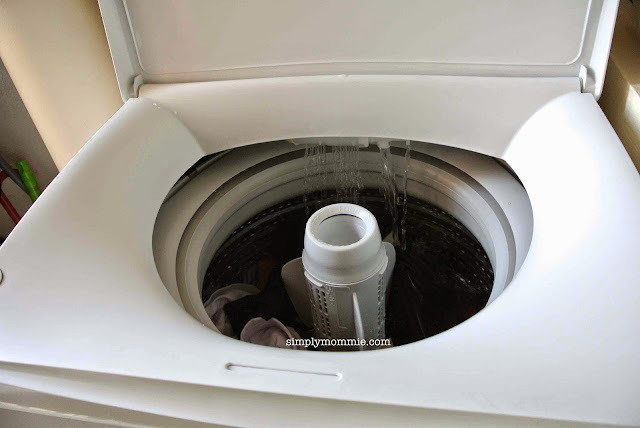 I down at least two glasses of water with a couple of drops of Young Living Lemon essential oil before I set the laundry to wash and boil water. He wakes, so I nurse him then I give him a quick shower, mainly to clean his lower half of the body. 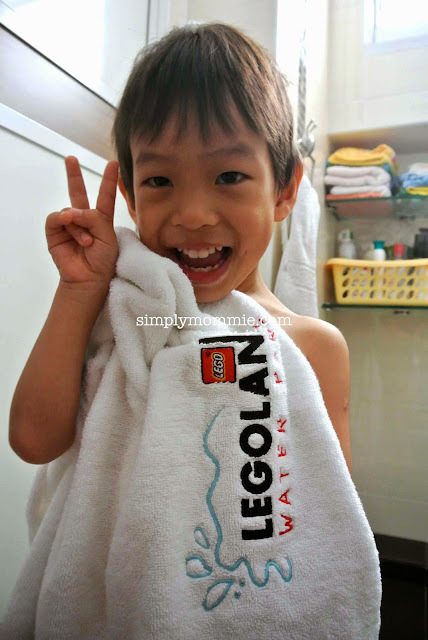 One of the kids’ favourite towel from Legoland Malaysia when we went last year! Then we have our breakfast. These days, I take mainly black coffee instead of the usual kopi from Toastbox so I’ve started making my own kopi-O at home. 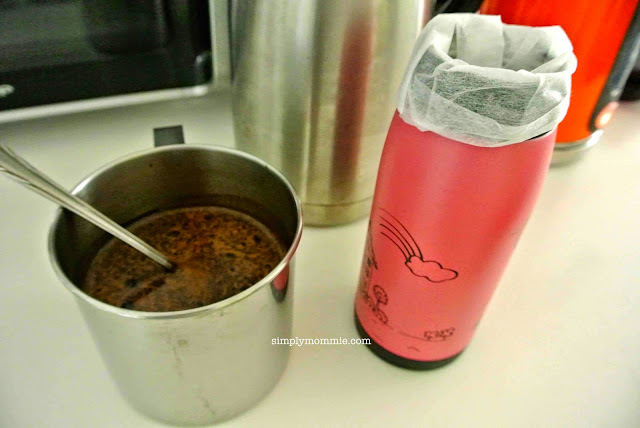 I make two cups – drink one for breakfast and store the other in a flask for my after-lunch fix. After my coffee, I feel more human and start to do some chores like folding clothes and by this time, the washing machine is done with its cycle so I hang the clothes. After that I do the lunch prep and all these happen while my boy takes his breakfast and has his free play time. Sometimes he finishes early and wants to join in lunch prep instead of playing, but today he’s happy playing on his own. 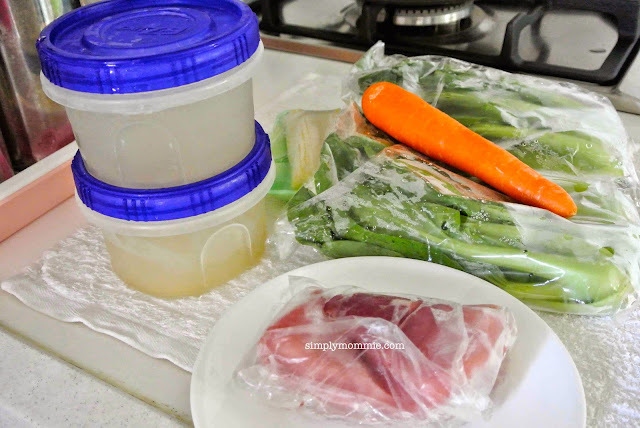 Lunch prep usually doesn’t take more than 20 minutes since most days I rely on my stash of frozen soup stock (my basic soup stock recipe) which I boil and store once or twice weekly. 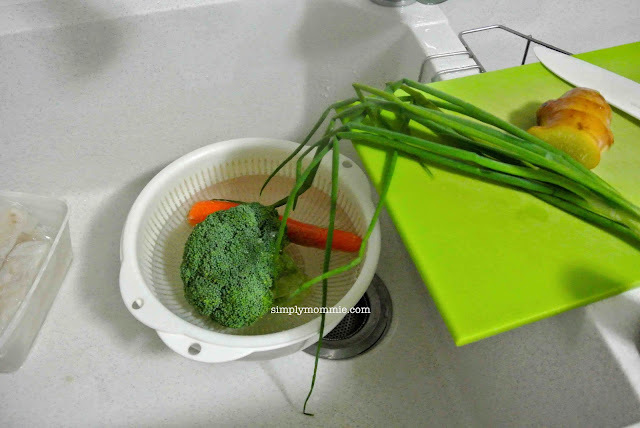 Hence lunch prep usually involves prepping the vegetables, slicing meat/ prawns and marinating the meats, nothing too fancy or difficult as it’s usually a one-dish meal for lunch (click the link to view the one-dish meal menu on the blog). After lunch prep is done, I set the barley to boil, and while my boy is still playing, I’ll look through what I’ll be doing with him for the day. Currently we’re working through the BFIAR (Before Five in a Row) curriculum alongside the Letter of the Week curriculum (which we’ve been doing on and off since he sometimes gets bored with the activities). I’ve prepared all that I need for the BFIAR curriculum and put it together in lap-file style and will take out what I need for the week to store in a separate clear folder so I needn’t lug out the heavy file every time. 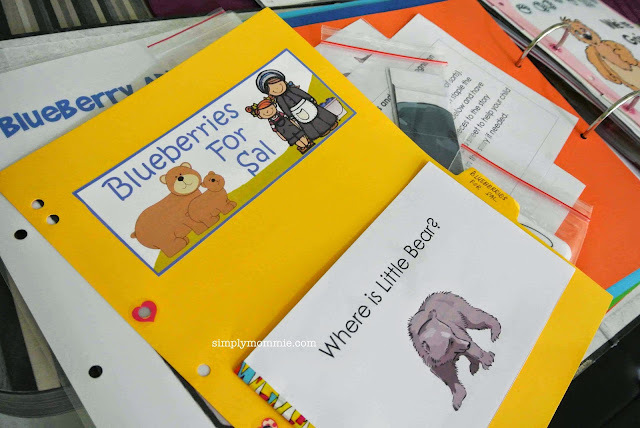 I used the BFIAR curriculum loosely with my girl in the past and really liked the literature-based learning approach so I have decided to adopt it for teaching my boy too (check out the literature-based learning posts on the blog). In a couple more months we should be moving on to the FIAR (Five in a Row) curriculum. 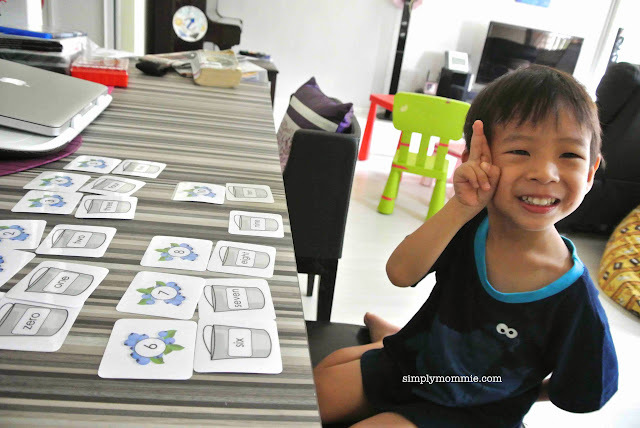 Doing the kuplink, kuplank, kuplunk of blueberries in our tin pail, plus some math using the description in the book – he enjoyed the eating most of course. Doing the letter S in our Letter of the Week curriculum – Do you wanna build a Snowman? 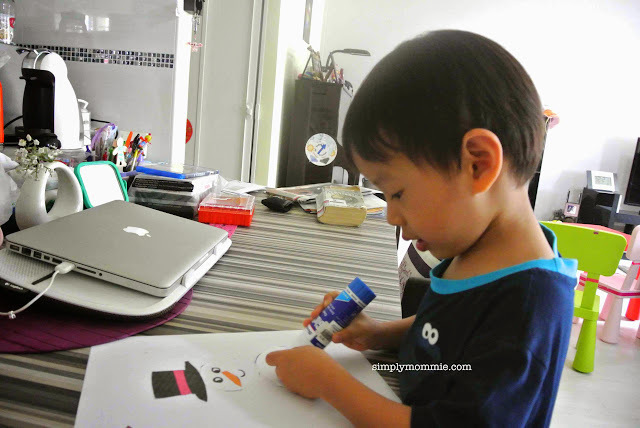 : he cut out pieces of a snowman and is working to build the snowman on a sheet of paper with glue. By the time lunch is ready, so is the barley, so everyone gets at least one cup during lunchtime (click on the link for the Drinks Index on the blog). After my boy and I are done with our lunch, we head off to pick up my girl from school. Today it poured so we hurriedly just got into the shower once we got home. Then it’s lunchtime for my girl while my boy chooses to either hang around to chat with his sister, watch 巧虎 or go and play with toys or work on puzzles. 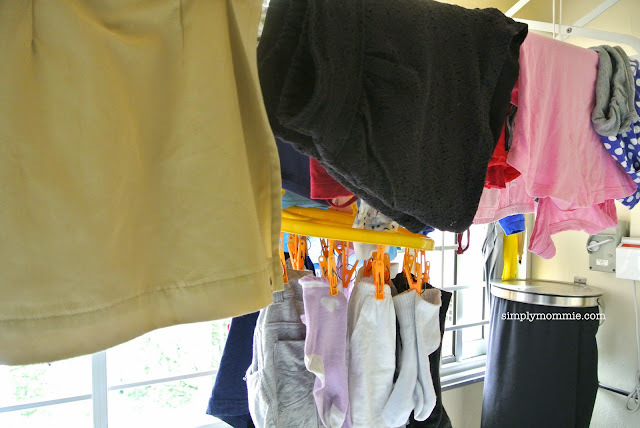 Due to the extremely hot weather recently, we’ve not been heading to the playground for lunch and since it rained today, that was completely out of the question (click to read more about figuring out a schedule for my P1 girl). While she takes her lunch, I take the time to either prep dinner (especially if I’m boiling soup for dinner) but today I decide to just read a book in bed for awhile. After lunch, I’d let them rest for awhile before doing homework but today we had a bit of extra time since we didn’t head to the playground so the kids got to play with the homemade play dough from one of my homeschool co-ops. After an hour, I get them to wash up after themselves while I clean up. After that, teeth get brushed and we either read a book or play Spot It before nap. While the kids nap, I usually rest a little while in bed before heading out of the room to read a book/ blog/ do yoga/ do dinner prep. Today since I didn’t have much time and I’ve missed my Zumba class for two weeks due to the instructor being on hospital leave, I decided that some stretching would do me much good. After yoga and some squats, I start preparing dinner. I start cooking dinner, and most of the time, the kids will wake some time during this period of time. They laze around till dinner is ready then we take dinner. 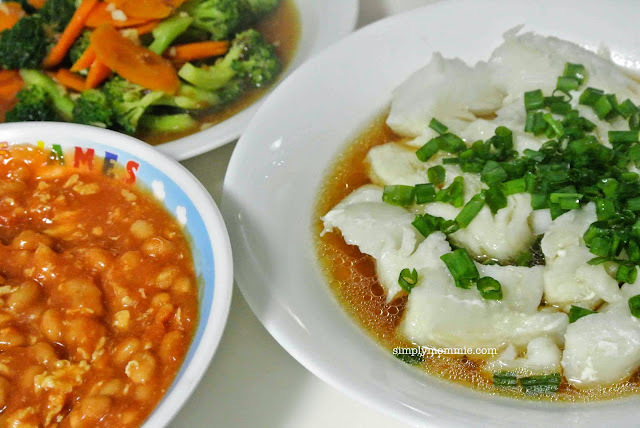 Dinner is simple fare – baked beans with egg, broccoli and carrot stir-fry and steamed cod with soy sauce – since we’re all feeling a bit under the weather lately (you can check out the Fish and Seafood Index on the blog if you like). After dinner, I wash up the dishes, then rest a bit with my hubby while sharing a tea/coffee. We catch up about each other’s day while the kids rest after dinner then I coach my girl in her schoolwork. Most of the time my boy clamours for attention so I’d get him to practise some writing or give him a puzzle or let him work on his scissors skills. If my hubby is feeling up to it, he would provide my boy with some guidance. Then it’s time to prepare for bed! A bath, more books and Spot It games then goodnight hugs and kisses are exchanged and my girl heads off to sleep on her own. My boy nurses then rolls around in bed for awhile before he falls asleep on his own. Meanwhile, hubby and I catch a DVD together till he’s tired and that’s it – the day with the family is done. I carry on for awhile more on my phone, playing some games and checking FB updates before sleeping. It’s been quite a challenge to go to sleep early – something in my list of resolutions (15 in 2015) that I’m still working on! This post is part of the Day in a Life blog train hosted by Mum in the Making. 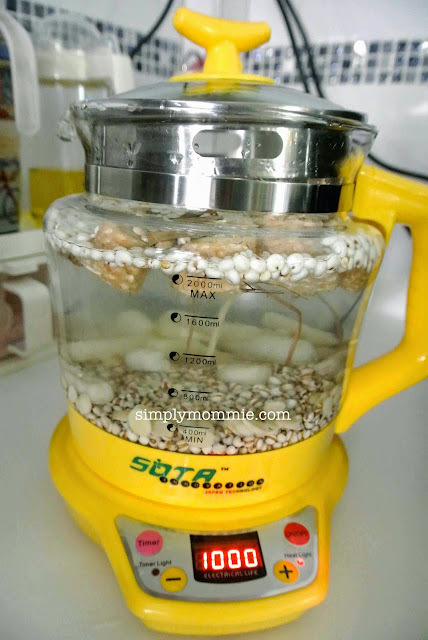 Next on the blog train is Danessa Foo from PrayerFull Mum. Danessa was a corporate finance officer turned school teacher. 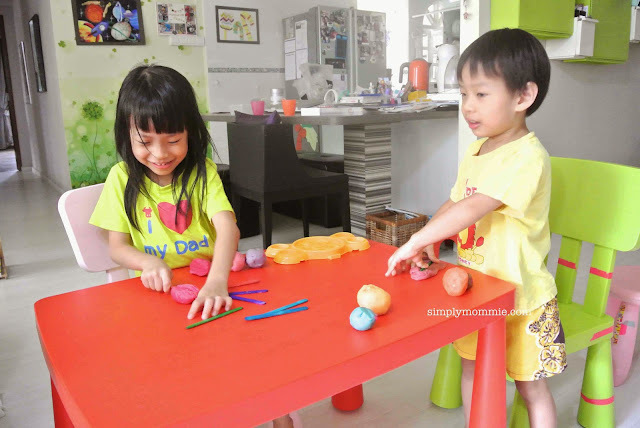 She started to embrace the new season in her life as a Stay-at-Home Mum now that they are back to their homeland Singapore after being overseas for 2 years. 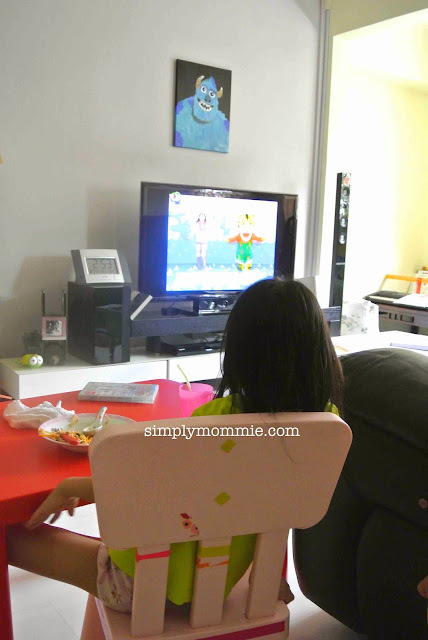 Read on to find out how she copes and manages the household on a daily basis. This entry was posted in Blog Trains, Memories. Bookmark the permalink. Wow, it’s amazing how your day is filled with so many activities with your kids, the cooking and yet get to squeeze time for yourself. Nice! 🙂 Enjoyed reading it! I loved how you squeezed in time for exercise and reading even in a busy day! And that BFIAR file, so organized! Thanks for sharing your day! I spent quite a bit of time putting the file tgt but it’s so worth it!! Thanks for hosting the train! 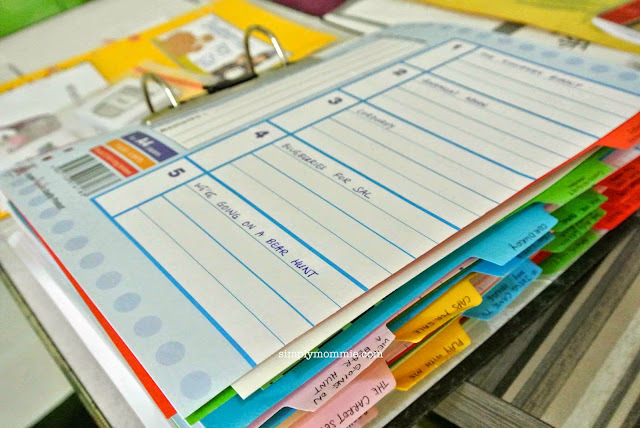 You are so organised! And so calm! And so effective! Thumbs up! You’re very disciplined and a great organiser! What a fulfilling day. : ) Such a coincidence, I’m doing Blueberries for Sal as well my my boy! 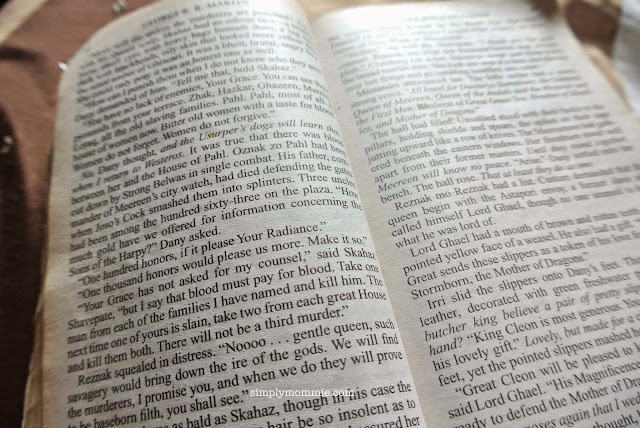 What chapter book are you reading with your gal? Looks interesting a very polite exchange of savagery. lol.